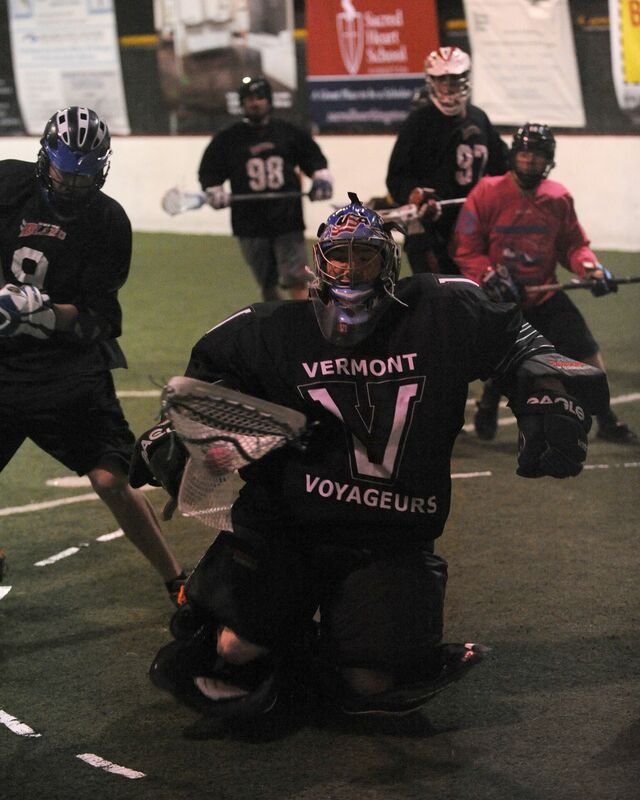 Both Boston Box Lacrosse League games on Jan. 22 ended with one team scoring the last four goals of the contest, and with a final score of 12-11, but the similarities mostly ended there as the Minutemen used their closing spurt to overtake the MegaWhales, while Bullseye fell just short in an attempt to come back against the Blazers. In the opening game at South Shore Sports Center in Hingham, Mass., the Minutemen jumped out to a quick lead with Cullen Murphy netting the first goal and feeding Rob Murray for the second before the MegaWhales woke up in their first game back from the extended holiday break. A four-goal run with two scores each from Mike Maggio and Greg Melaugh gave the Whales their first lead of the night and Melaugh connected two more times, answering each Minuteman score to make the count 7-6 MegaWhales at the half. After Will Jennings scored his league-leading 35th goal – his only score of the night – to knot things up at seven, the Whales got markers from Melaugh, Dan Hettler and Sam Houston-Read to take control of the game. When Rob Murray answered for the Minutemen, it was Maggio with an immediate response off the ensuing faceoff to make the score 11-8 midway through the period. From there, however, it was the Minutemen who got the breaks and the better scoring chances, with Dave Saccocci finishing a Jimmy Cunningham drive, then Murray scoring his third and fourth markers of the night, tying the score at 11 with 1:29 left in regulation. On the ensuing faceoff, Jennings scooped up the loose ball and fed a streaking Nick Black, who potted the eventual winner as goalie Andrew Forrester (20 saves) held off a furious last-second rally attempt to close out the win. Along with Murray’s four scores, Jennings notched his goal plus three assists, Saccocci had three points and Cullen Murphy two to lead the way for the Minutemen. The MegaWhales got six points from Melaugh (5-1) and Maggio (3-3), plus multi-point nights from Dan Hettler and Erik Swanson. The win virtually ensured that the Minutemen will reach the playoff round – though they have not mathematically clinched a berth yet – while it pushed into a tie with PrimeTime for the fourth and fnial playoff spot. PrimeTime has the edge in a tiebreaker because it won two of three games it played against the Whales. In the nightcap, Josh Graver scored twice on blasts from the outside, and Garrett Naimie added a quick goal and assist to Kurt Hunziker as the Blazers opened a 4-1 lead mid-way through the first half. Greg Rogowski – the league leader in assists (22) and points (53) – scored once and fed Brandon Dube to help extend the lead to 6-4, before John Uppgren netted his first of the night and Chris Breiner finished a slick feed from Adam Fishman with one second remaining to make the score 6-4 in the half. The teams traded goals to open the second half and after Fishman and Breiner had consecutive scores to cut the deficit to one with 14 minutes remaining in regulation, the Blazers scored two quick goals and a total of four over the next nine minutes of play, extending the lead to 12-7 while watching goalie Joe Evans stymie quality scoring chances. In the last five minutes of play, however, Bullseye closed the gap on goals from Beau Wood and Uppgren. The Blazers committed two penalties and went two men down with just over two minutes remaining in the game, and Uppgren scored a man-up marker with 1:09 remaining, Wood finally netted another – after Evans made multiple stops on point-blank shots – with just seconds remaining in regulation and the Blazers were able to tie up the game’s final faceoff and deny Bullseye any final shot on net. The win clinched a playoff berth for the Blazers and marked the first loss of the season for Bullseye, which had already locked up the regular-season title. Rogowski’s five points led the way, but Naimie and Kyle Baker both had four-point nights, Dube and Graver added two goals each, and got two assists and a team-leading seven loose balls from Jared Arntzen. Evans finished with 41 saves, many of them one-on-one and point-blank stops. The BBLL returns to action next week with the MegaWhales facing Bullseye and PrimeTime meeting the Minutemen. In the race for the fourth-and-final playoff spot, PrimeTime holds the tie-breaker edge against the MegaWhales – on the strength of two wins in the three games those teams have played – meaning that the MegaWhales must win one more game than PrimeTime does in the season’s final two weeks in order to make the playoff round.